A final divorce arrangement looks likely to be pushed back to December now, leaving little time for countries to ratify the deal. EU LEADERS HAVE warned there must be more progress in Brexit negotiations, despite hearing a personal plea by British Prime Minister Theresa May yesterday, who said she was open to a longer transition phase to unblock the talks. European leaders had hoped to hold a special summit in November to seal the divorce, but they refused to sign off on the plan yesterday, taking the bloc a step closer to the potentially catastrophic scenario of Britain crashing out in March without a deal. May had earlier addressed her fellow leaders, indicating that she could accept extending the post-Brexit transition phase to take the heat out the deadlocked issue of the Irish border, officials said. But she failed to respond to a call by EU President Donald Tusk for “concrete proposals” of her own to move the talks forward. 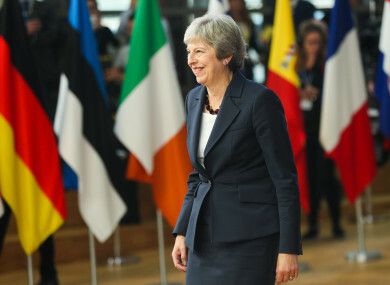 Speaking to reporters as she arrived for a second day of EU summit talks in Brussels this morning, May confirmed she was considering extending the transition period after Brexit for a few months to give time to agree a new trade deal with the European Union. “A further idea that has emerged, and it is an idea at this stage, is to create an option to extend the implementation period for a matter of months,” she said. “But the point is that this is not expected to be used, because we are working to ensure that we have that future relationship in place by the end of December 2020. “I’m clear that it is possible to do that (deal) and that is what we are working for. When the other 27 European Union leaders met without her over dinner yesterday evening, they concluded that “not enough progress has been made” in the negotiations, an EU official said. The senior source said the leaders agreed talks should continue but, for now, they are “not planning to organise an extraordinary summit on Brexit in November”. Dutch Prime Minister Mark Rutte said EU leaders had asked the bloc’s executive “to work with even more vigour on a no deal scenario”. Taoiseach Leo Varadkar told reporters yesterday that he’s open to new suggestions on how to break the Brexit deadlock but said that an extension to the transition period “couldn’t be a substitute for the backstop” on the Irish border. According to an Irish Times/Ipsos MRBI poll published this morning, almost three-quarters of people believe that Ireland should stick to its position of avoiding any sort of new border with the North. While 72% supported the government’s position, 20% said it should be prepared to compromise if it would help achieve a Brexit deal. Separately in the poll, 54% of people said they were “very concerned” that a Brexit border could damage peace in Ireland, while 17% said they weren’t that concerned or not concerned at all. Expectations were low before this week’s summit in Brussels, once dubbed a “moment of truth” for Brexit, after a breakdown in talks between the lead negotiators at the weekend. “I hadn’t expected a breakthrough, and there wasn’t a breakthrough,” Austrian Chancellor Sebastian Kurz said after the dinner. Earlier, May had urged her fellow leaders to work with her to find a “creative way out of this dilemma” on Ireland, a British official said. “I remain confident of a good outcome. The last stage will need courage, trust and leadership on both sides,” she said. Antonio Tajani, the president of the European Parliament, said May offered them “nothing substantially new” to discuss. But he said she was “not against” the idea of extending the transition, a position confirmed by the EU official. Diplomats say EU negotiator Michel Barnier is willing to add a year to the already planned 21-month post Brexit transition period, when Britain’s relationship with the bloc stays largely the same. But the idea is controversial among May’s eurosceptic Conservative MPs, who fear it is simply a way of delaying Britain’s exit. Asked about the plan, a British official said there were no plans to propose a change to the transition. As he arrived for the Brussels meeting, Barnier had said “we need time, we need much more time” for talks, vowing to work “calmly and patiently” for a deal in the coming weeks. The idea of extending the transition would be to give more time to negotiate a deal on future relations and find a formula to defuse the Irish border question. Negotiations are stuck over the issue of a backstop to keep open the border between British Northern Ireland and Ireland if and until a wider trade deal can be signed that avoids the need for frontier checks. Britain has proposed staying temporarily aligned to the EU’s customs rules, but the bloc wants this to have no end date — something her eurosceptic MPs will not accept. The EU is also insisting on its own backstop, which would see Northern Ireland alone stay aligned with the bloc’s customs union and single market – something Britain will not accept. Email “Irish backstop impasse haunts May as EU leaders nix November special Brexit summit”. Feedback on “Irish backstop impasse haunts May as EU leaders nix November special Brexit summit”.